4 Legged sprinkler connection stands (2", 2.5" and 3" inlet/output) are perfect for any irrigation sprinklers operating up to 8 - 9 bar pressure! When they are used with quick coupling systems, installing a sprinkler takes only seconds! 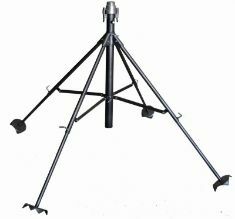 Save money and time with DuCaR sprinkler stands! They are perfect for any portable and stable irrigation systems. We strongly recommend you to use them with any DuCaR 2" and above gear drive sprinklers and all other sprinkler brands ie. Nelson, Sime, Komet, Nodolini with 2", 2.5 and 3" female inlet.